On Friday April 28th 2017 from 7.00 ’til late. This will be followed by chat finger food, and music. SLIP AGM: 6.00 all most welcome to attend. 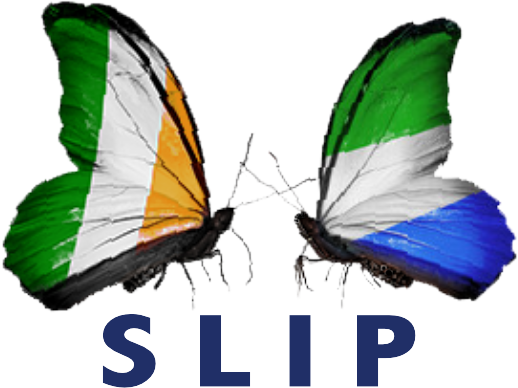 Sorry, SLIP Colleagues – I’m just back from Yengema and Freetown last night after our ‘YSS 2020 Vision’ Conference, so I won’t be able to attend the annual Independence Event tomorrow. Best wishes for a great evening and a very educational experience from Garret Campbell and (?possibly) Gráinne Horan of Global Schoolroom. My regards to all SLIP folk and guests, but also to any other old Yengema or Kono hands on deck – e.g. Austin Healy & John Flavin CSSp; Paddy Daly, Adrian Bourke, Ciaran McGoey, Paddy McDermott, Eddie & Eimear Melvin, Brendan Durnin. There’s a raft of others, but it hasn’t been easy persuading them to give SLIP a go at least once a year. More networking and arm-twisting required, I’m thinking. Two fairly hardworking, and at times hard-hitting, days at YSS. Good active support and leadership throughout from Archbishop Edward Tamba Charles, one or two Old Students from Freetown (Dr Aiah Mbayoh, Gloria Bayoh); Abibatu Sangarie-Daramy from Maryland USA; and Khai Sam (aka KAPS since 1968) who flew in from South Sudan where he’s an aeronautical engineer with UNMISS. Absence of Governance, Diocesan Patronage, in-school leadership and gender imbalance in teaching staff were all confronted to good effect. Archbishop Charles to present Bishops’ Conference in Kenema tomorrow with Pope Francis’s prescription for a “dynamic pastoral ministry of education” to show they mean business re their Catholic schools. Bishop Koroma is due to go overseas shortly for upgrade to his pacemaker, so he may not be able to attend their Kenema confabs. A fair-to-middling-to-good result so far. I’m even more convinced than ever that more forward muscle-flexing and less nostalgic molly-coddling is what a failing school needs anywhere. Eddie, thanks for the comment and report. The Annual event went very well with a good mix of over 60 people, including at least 4 of the 6 teachers who will be going with Global Schoolroom. Garret Campbell made and inspiring speech. The SL music added to the occasion! you were missed but we understood your absence. At the AGM Elizabeth was elected Chair and Sean Farren accepted the role of web minder! I hope you have recovered from your trip and do keep in touch. Geraldine.